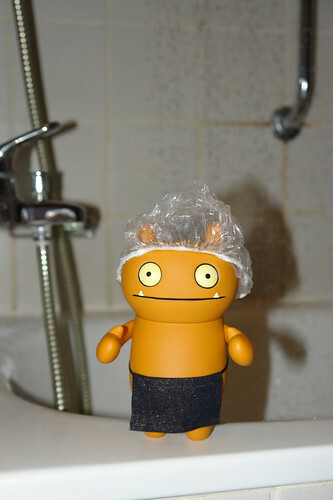 Uglyworld #154 - Wage Ready For A Shower, originally uploaded by www.bazpics.com. Wage was bored last night after dinner in the hotel as it was throwing rain down outside in Leuven by the bucketload. He was complaining that he wouldn't be able to visit some of the tourist attractions in the city if it didn't clear up by Wednesday night as we're due to head home to Germany on Thursday evening. His boredom took him to all corners of the hotel searching for something to amuse himself with, he returned to the room holding a small packet - I asked him what it was but he said "you'll see" while disappearing into the bathroom. A few minutes later out he came wearing a shower cap, saying "This will work for the rain outside", I tried my best to explain to him that it would only keep his head dry - he didn't want to listen to me and decided to prove it by wearing the cap and standing under the shower.